Plays a role in transcription activation of the HIV-1 promoter and regulates the switch between active transcription and latency. 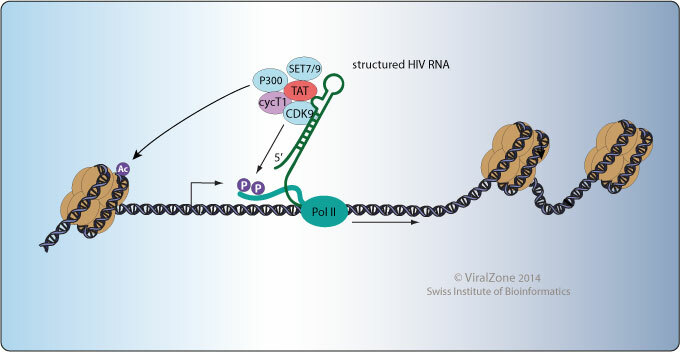 Recognizes TAR RNA sequence on nascent HIV RNAs and recruits the cyclin T1-CDK9 complex that will in turn hyperphosphorylate the RNA polymerase II to allow efficient elongation. 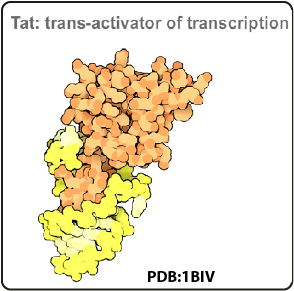 TAT also recruits the histone acetyltransferases (HATs) CREBBP, EP300 and PCAF to the chromatin to provide a favorable environement for viral transcription. When provirus emerge from latency, the initial rounds of transcription are very limited until new TAT synthesis occurs after about 2 hours.